The aerolite specifications page is a guideline for Installers as well as homeowners. Therefore Aerolite Specifications are listed below for all Aerolite sizes and thicknesses. Install the correct thickness Aerolite for your zone. Aerolite is one of the oldest forms of roof insulation and is still one of the major contenders in the market. Aerolite thinks pink has been installed in South Africa for more than 40 years. And in Europe and the UK for more than 90 years. The insulation product has evolved over the years to be one of the most energy efficient thermal insulation products. In fact, it is compulsory for the correct thickness of Aerolite to be installed on all new homes. Therefore the chart will be a good guide for all new homes. In fact, the energy saving cost will be covered in a few years. In fact, Aerolite Ceiling Insulation is an Eco-friendly insulation product produced from recycled glass bottles. 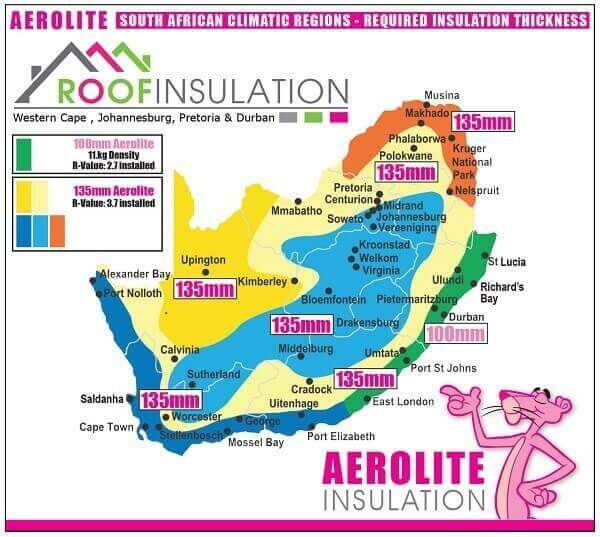 The Aerolite 135 mm roof insulation is SANS compliant for the Western Cape region as well as Johannesburg and Pretoria. The Aerolite Roof Insulation will achieve the recommended R-value of 3.70 as per the new legislation. In fact, the Aerolite 100 mm installed as a top up on homes that have been fitted with the lower thickness Aerolite. This will bring your home up to SANS compliant status. Installing Sans compliant Aerolite 135mm Insulation for a Cool in Summer and warm in winter with years of energy saving.